The crew of the U.S.S. Discovery find themselves stuck in a time loop caused by the greedy, meddling Harry Mudd (Rainn Wilson). Mudd wishes for nothing more than to sell the Discovery to the Klingons to help them win the war and destroy Starfleet. Because of Stamets’ (Anthony Rapp) newfound abilities (caused by being the “pilot” of the spore drive), Stamets finds himself to be the only one continuously aware of every time loop. 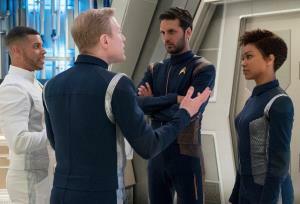 His mission becomes convincing Burnham (Sonequa Martin-Green), Lieutenant Tyler (Shazad Latif), and Captain Lorca (Jason Isaacs) of this repeating time loop. If they can manage to believe Stamets, they can find a way to overpower Mudd. Time loop episodes are a cherished, classic trope in the Star Trek universe. They can be hard to pull off because of that whole tricky “temporal” factor, though. What is so fascinating about the science fiction genre is how close to scientifically accurate the writing has to be in order to convince an audience. If even one factoid is off or unbelievable, we nerds and geeks know and the writer won’t soon forget their folly. So really, while time loops can be stimulating, they can also be challenging and exhausting. Star Trek The Next Generation (TNG) had a few time loop episodes. One in particular, in Season 5 (“Cause And Effect”), was probably the most impressive. The end result was the total destruction of the Enterprise. Because Dr. Beverly Crusher had a feeling of déjà vu which caused her to predict each hand in a game of poker, crew members began to pay more attention to her doubts about what was happening to the ship. Long story short: after everyone is finally convinced they are stuck in a time loop that causes the Enterprise to explode, Data suggests recording one short message that his positronic brain would keep as a warning for the next time loop. The number “3” surfaces almost everywhere and triggers Data’s reaction when he notices the three pipes on Commander Riker’s collar. This pushes Data to take Riker’s advice instead of his own and thus, the time loop ends. Why bring up this particular episode up? That time loop episode swelled with finesse. Each detail in the episode was strategically chosen. Despite the loop causing the episode to start over four times (if my memory serves me right), it was miles from uninteresting. Since time loop episodes are so difficult to create, I was afraid for Star Trek: Discovery when I realized, shortly in, that this was a time loop episode. I like the series so far, but this type of episode would certainly be a test. Despite the episode being obviously unusual, it did not disappoint. I would like a short sidebar to say that while I won’t keep my hopes high for Star Trek to change the intro, I’m still not a fan. Sure, I appreciate the “Renaissance” feel, but I honestly think they should’ve instead used more inspired throwbacks or homages to Star Trek The Original Series and TNG. You know, maybe either Burnham or Captain Lorca speaking at the beginning while we scroll through the Alpha Quadrant and/or Earth, Vulcan, or Q’onoS (Kronos). Really, just bring back the intro style we all love so much. Use a voice and a passionate orchestra! Captain Lorca especially has an inspiring voice, and of course, so does Burnham. But anyway, I digress. This was a filler episode and gave the audience a break from the intense storylines thus far. The time loop might have been a “filler,” but it still managed to serve as an intriguing curator of the histories of multiple characters. Filler episodes are often viewed as a wasteful distraction, but in this case, I thought the episode was both pleasing and functional. At the beginning of the episode, Burnham writes in her personal log that the U.S.S. Discovery is the most important asset in the war against the Klingons. Of course, this also means that the Discovery is the number one target. As a party rages on in the Mess Hall, Burnham stands in a corner chatting with a tipsy Cadet Tilly. They chat about Lieutenant Tyler, who Burnham seems to have a crush on. Not used to being among other people for the single purpose of pure amusement, Burnham feels a little uncomfortable when Tyler reaches out to her. But before he has the chance to ask her to dance, they are both called to the main bridge. On their way to the turbo lift, Burnham accidently bumps into a happier, bubbly, and even babbling Lieutenant Stamets. Doctor Culber (Wilson Cruz) catches up shortly behind Stamets and mentions that Stamets hasn’t really been the same since “piloting” the spore drive. For Stamets’ comfort, Dr. Culber created a device to ease the process of his partner functioning as the main engine of the drive, the creation of which elates Stamets. Later, it is revealed that Stamets is now the key to spore drive operation and therefore, probably the most valuable asset of Discovery. Without him, there is no spore drive and the jumps can’t happen. Stamets is the only one outside of the time loop due to his connectivity to the spore drive and the organisms that power the jumps. He witnesses and is cognizant of every time loop and attempts to convince Burnham especially that they are stuck in a time loop. Stamets finally asks her to reveal one secret to him that would help her believe him in the next time loop so they can successfully overpower Mudd. When finally Stamets comes to Burnham at the party, he parrots her secret back to her in the next loop: “You have never been in love.” The strategy works and she listens. 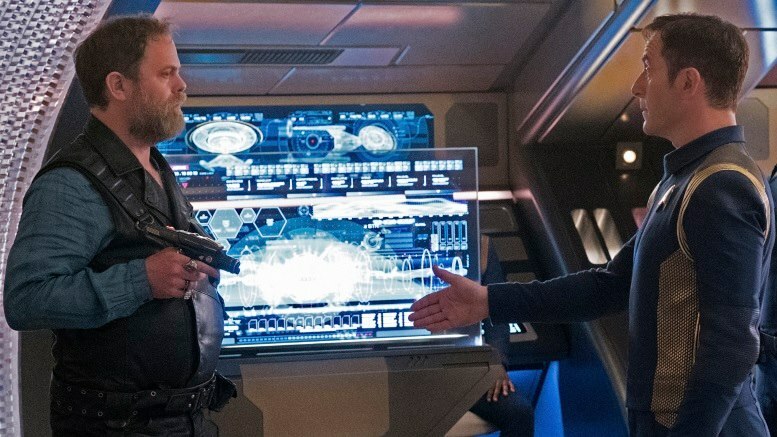 Stamets wants Lieutenant Tyler to talk about his time in the Klingon cell with Harry Mudd to gather any useful intel that could be used against Mudd. Confused, Burnham asks why Stamets didn’t directly ask Tyler. With a smirk, Stamets admits that it’s because Lieutenant Tyler has a crush on her. The repetition and relentlessness of Lieutenant Stamets (and the whole spore drive bit, too, of course) proves a new, foundational importance for Stamets. Honestly, I love it. He’s no longer just a frustrated side character scientist, but committed and deeply intertwined with storylines. In the previous Star Trek series, the engineer was always a character present in the show, but never truly shone brightly. More of a sideshow. In Star Trek: Discovery, I think the engineer/scientist role has finally transformed into a relevant role. Stamets reacts boldly with removed decorum but heightened integrity and honesty. His sarcasm is always spot-on. Filler episode or not, I suspect the role of the episode, en large, was for us to glimpse more of these facets of Stamets’ personality and to ask: Why is he so different? Does his ability to stand apart from the time loop have any relation to his reflection in the mirror being delayed? Has he crossed over the looking glass? 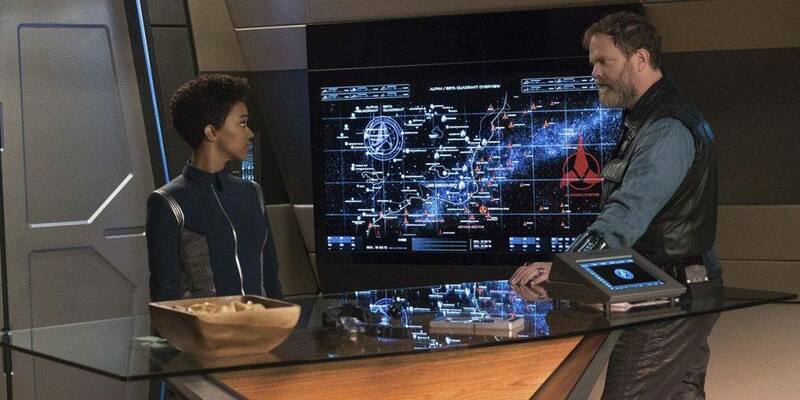 While Lieutenant Stamets convinces Burnham that the U.S.S. Discovery is stuck in a time loop and she needs Tyler to talk about his many months in the Klingon cell with Mudd, Harry Mudd himself doesn’t waste any time infiltrating the ship. 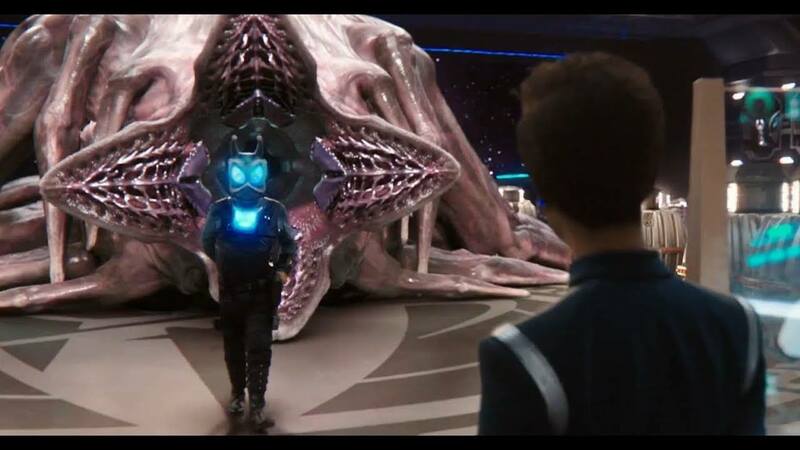 On the bridge, before the time loops had even started, Burnham asked Captain Lorca to beam a gormagander (commonly known as a space whale) on-board as the creature seemed to be in pain and in need of assistance. Captain Lorca approves, bound by the law regarding endangered species. Shockingly, Harry Mudd steps out of the gormagander and immediately kills every officer in sight. Several times during the time loops (fifty-three at the very least), he beamed on-board Discovery and killed everyone who interfered. Harry Mudd may have thought of everything, but ultimately, he didn’t account for the wit of Burnham and Stamets, as well as the trust that Captain Lorca places in them. Blinded with vengeance and greed, Mudd takes malicious pleasure in killing Lorca repeatedly as he easily overtakes the Discovery each time the thirty-minute loop restarts. The most creative weapon Mudd used was for his second to last attempt at possessing the Discovery: Dark Matter Bulbs, or dark matter that has been weaponized to work as a killing machine, tearing molecules apart in the most torturous and painful manner. Personally, I feel the need to read the science behind this. The concept absolutely fascinates me. After Tyler is hit by a bulb, Burnham witnesses her first crush and friend disintegrating in agony. In that moment, she refuses to let Mudd win, but also restrains herself, knowing that through the time loop, they have all the time in the universe to perfect a plan. 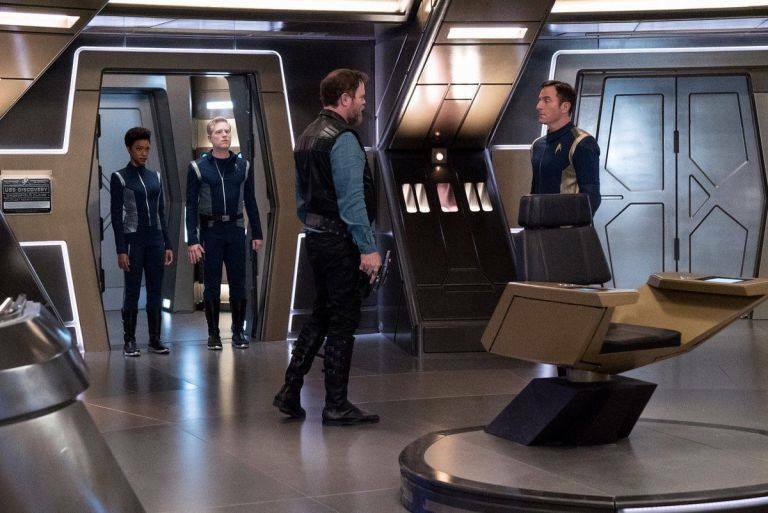 Finally, Lieutenant Stamets reveals himself to Mudd as the last piece needed to make the spore drive work, but as he hails the Klingons, Burnham walks into the Captain’s Quarters. She confesses to Mudd that she is the mutineer who assassinated the Klingon’s messiah, T’Kuvma, and therefore might be worth even more than the Discovery. Then, to buy some time, Burnham swallows the dark matter bulbs and disintegrates before Mudd’s eyes. Aggravated, Mudd starts another time loop. When the final time loop begins, the Main Bridge crew await Harry Mudd’s entrance. They give him reign over the ship. Captain Lorca surrenders it to him willingly after he has Mudd agree that no killing will occur during the change of hands. 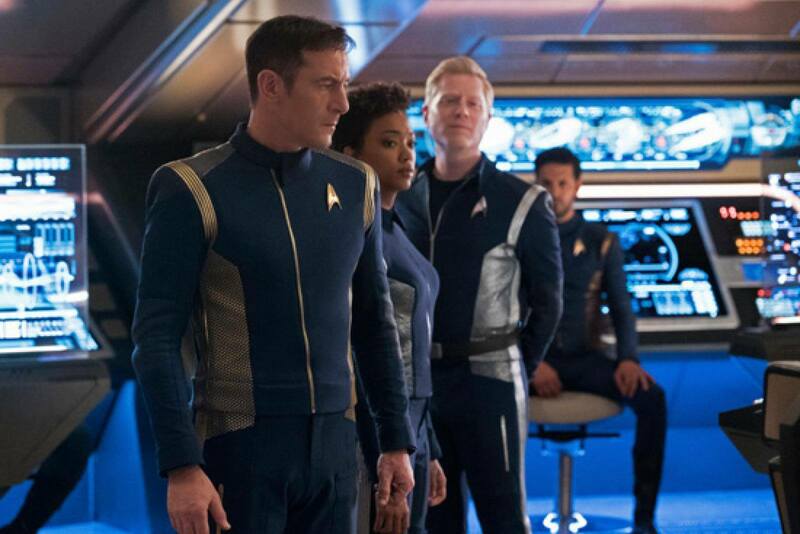 Burnham and Stamets follow with their new “Captain” on his way to meet the Klingons he had hailed. En route, they are stopped by Lieutenant Tyler, who reveals he had changed the chair’s command, as well as other independent systems. Instead of hailing Klingons, Mudd thus hailed his wife, Stella (Katherine Barrell)’s father, Baron Grimes (Peter MacNeill). Harry Mudd is no longer a funny villain on Star Trek: Discovery. Instead, he is a real, vicious thief with a taste for blood and vengeance, and above all else, the need for power. It’s clear that his only goal, despite claiming that Captain Lorca stole him from Stella (clearly a deception on his part), is to see Starfleet suffer. But his manipulations are captivating. The series of time loops was riveting. The only thing I would’ve liked to know was if the gormagander was actually saved. Again, I’m an animal lover. I can’t help it. The interaction between the characters has become more organic and is better established. Captain Lorca even had a few humorous moments with Commander Saru, which was mildly reminiscent of the Picard/Data relationship. It is heartwarming to see what seems to be inspiration arising from the various previous series as the Star Trek: Discovery adapts into an even more futuristic Star Trek. Can’t wait for next episode. I fear we’ll be back in the storyline between the Federation and the Klingons and likely uncover the potentially horrifying fate of Admiral Cornwell.